10:15 Expert meeting John the Theologian and his Paschal Gospel: A Prologue to Theology in the filmzaal: Fr John Behr held a dialogue with his Dutch colleagues about his academic work and specifically his forthcoming book on the Gospel of John. Respondents were the Syrian-Orthodox Archbishop Polycarpus, the V. Revd. Prof. Andrew Louth (Honorary Fellow of the Faculty), Prof. Peter-Ben Smit, Prof. Cees van der Kooi, Prof. Hans Boersma. The meeting was chaired by Prof. Bert Jan Lietaert Peerbolte. 13:30 What’s new at VU: ACOT! staff members of ACOT spoke about Orthodox theological education and the Orthodox programmes at VU. Eminent guests were Coptic-Orthodox Bishop Arseny and Archbishop Polycarpus. 15:45 Inaugural lecture of Fr John in the central hall (aula), entitled The Paschal Gospel: Reading John in Early and Eastern Christianity. 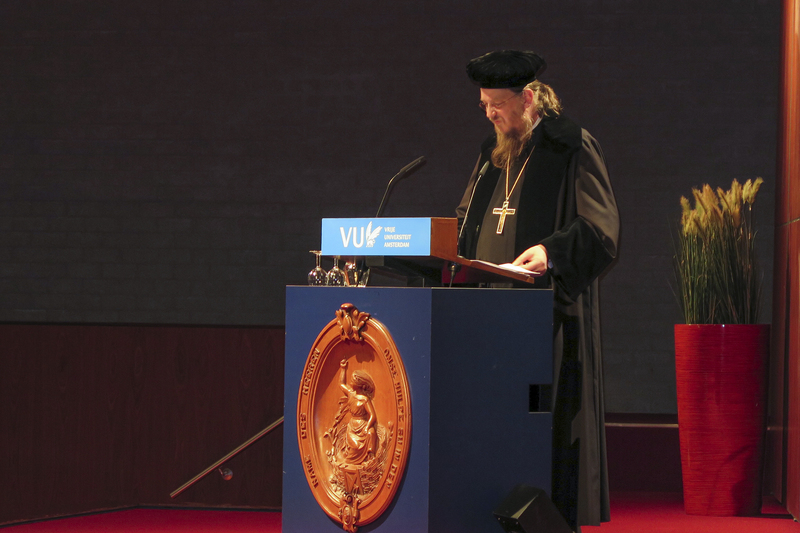 The vice-dean of the Faculty of Theology, Prof. Eddy van der Borght, presided over the academic ceremony. You can watch the inaugural lecture on YouTube or to our Vrije Universiteit Channel. The text of this lecture can be downloaded here and the text of the laudatio by Prof. van der Borght here. You can find photographies of the event on our Facebook page.